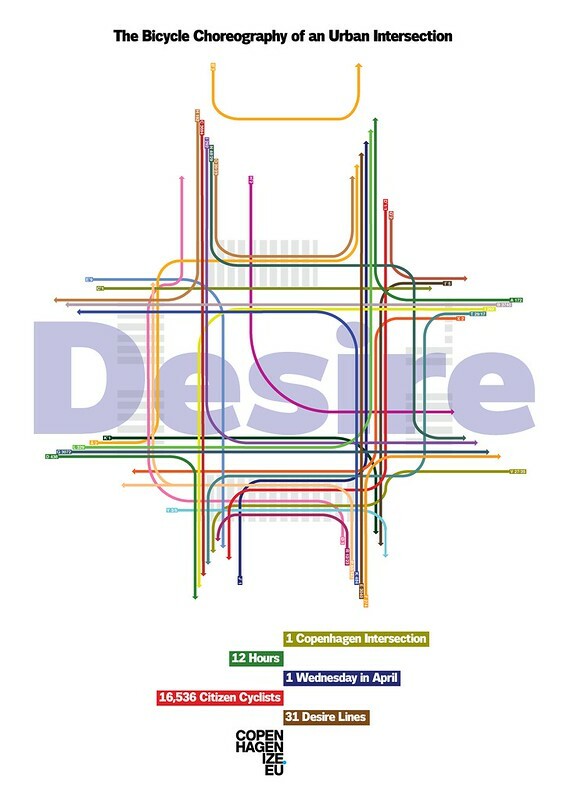 Here's the cover graphic of Copenhagenize Consulting's upcoming anthropological project tracking the Desire Lines of all the bicycle users in one Copenhagen intersection over 12 hours one day in April. We blogged about it earlier. Here's a .pdf of a larger version, if you fancy that. Opens in a new window. We filmed the intersection for 12 hours and anthropologist Agnete Suhr crunched the behavioural patterns over two months. Counting bicycle users and cars, tracking desire lines and observing the general behaviour of the bicycle users. While it was a ballet of human-powered movement, it was also a spectacular display of mediocrity. There were only a handful of "rogue cyclists chipping away at society's foundations with their reckless behaviour" out of 16,536 Citizen Cyclists. As we always say, well-designed infrastructure breeds good behaviour. While data maps are great for tracking... data... observing 16,536 bicycle users gives you a whole different perspective and debunks a lot of perception about urban cyclists. This intersection with it's 16,000 + cyclists is not one of the busy intersections in Copenhagen. We chose it because it is an east/west and north/south point, because it is a transport intersection without any shops or reasons to stop and, well, because we could film it out of the office window. The purple line in the middle is the bike messenger who pretended he was a car and use the car lane. "The" meaning one guy out of 16,538 people on bicycles. There were a couple of other half-hearted attempts to be a Volvo, but only one who lived the automotive dream. Although he popped back onto the cycle track after the turn. There's one in every crowd. Sheesh. The full results of the project will be released soon.